Not all yards are created equal. Sometimes people use this phrase to talk about lawn quality. For the purposes of this blog, we’re talking about actual, literal elevation. Some homes are built on higher elevations than others. But sloped yards that have no flat surface for a fence aren’t exactly the best for maintaining a fence for your yard or property line. If you have a house in an area with lots of hills, slopes, and different elevations, your home may benefit from a concrete retaining wall. But what is concrete retaining wall? How do you even know if you really need one? Just how many types of retaining walls are there? As stated earlier, a retaining wall is useful when your home is in an area with lots of uneven landscape. A concrete retaining wall is a wall that holds dirt and soil in place. That means you can install a retaining wall to create a flat space where you only had a hill before. It creates a useable space where there wasn’t any before. Retaining walls also help keep your home’s foundation from being affected by soil erosion. If the soil can’t move downhill and away from your home, there are fewer chances for the dirt holding your foundation in place to wash away, and less of a chance that your foundation will crack as a result. Erosion This has the potential to damage your property and other people. Soil will eventually flow away from higher elevations given enough time and heavy enough rain. Concrete retaining walls stop erosion by creating a barrier to hold dirt and soil in place. With no place to go, your yard will stay in place and not wash away. Retaining walls also help keep your foundation safe from cracking because of shifting earth. No Flat Boundary It is entirely possible to install a fence on a hill. It isn’t ideal, but it’s doable. Flat boundaries set a much clearer property boundary, and retaining walls are great for that. Contractors can build fences as part of a retaining wall installation as well. 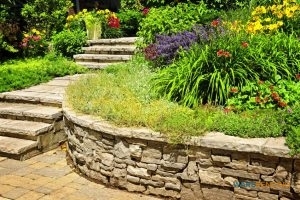 Property Value The style choices you make for your retaining wall also present your home with increased curb appeal. Creating useable space out of hills with stylish and functional material makes your home more appealing to people from the street. It also gives your home a little something extra if you decide to sell further down the road. Your contractors could feasibly pair your retaining wall with a stylish stone wall fencing installation as well. Useable Land Installing a concrete retaining wall gives you the opportunity to add more style and flat surfaces to your yard. Whether you’re using that space for gardening or for your patio or terrace, you have far more options than if you left your yard with steep slopes. 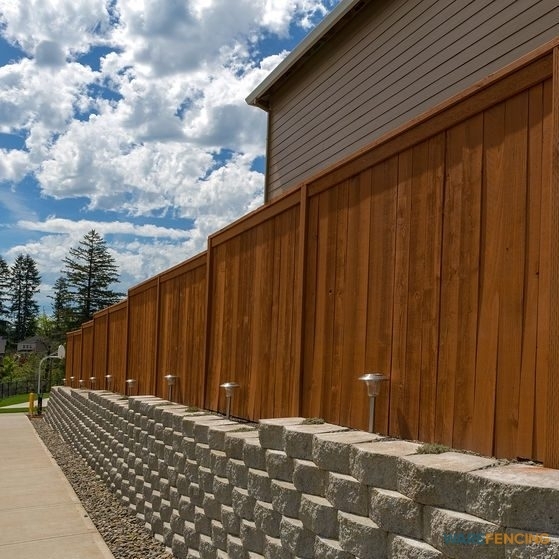 If you find yourself asking “How thick should a retaining wall be?” you should ask a fencing contractor. It will generally depend on the size of the area, quality of the dirty, quality of the building material, and other factors. Water Runoff This is a similar problem to erosion. Rainwater runs down your property. If you have a garden at the top of your hill near your house, it may not get as much water as you’d like when it rains. Also, with open hills for your land, it’s hard to control the drainage points of water from your lawn. A retaining wall allows you to install draining points that get the water runoff from your yard where you want it to go, which could feasibly keep your downhill neighbors happy as well. So you think your home or property may need a retaining wall, but you still have some questions. Many people ask the common questions like “How long do concrete retaining walls last?” and “How high can I build a retaining wall?” then you should look into zoning for your county and city. Different zoning codes exist in different areas, and knowing what you can and can’t do with your concrete retaining wall will help ensure you aren’t fined by zoning enforcement in the future. People also ask what the differences are with a concrete vs brick retaining wall or a concrete retaining wall vs wood one. Each method of retaining walls have pros and cons. Wood is easy to install and cheaper than other materials, but it rots quickly and deteriorates faster than the other materials. Brick is sturdy and looks good, but takes extended periods of time to create. It also needs special consideration for drainage. Concrete is strong, durable, and comes in many different design options. It’s only real drawback is requiring special contractors to install it properly. When you want to install a retaining wall you need quality craftsmanship to ensure a proper job. You may find yourself asking “How much does it cost to build a concrete retaining wall?” While the materials cost approximately seven to 15 dollars per square foot, you should be more concerned with labor. 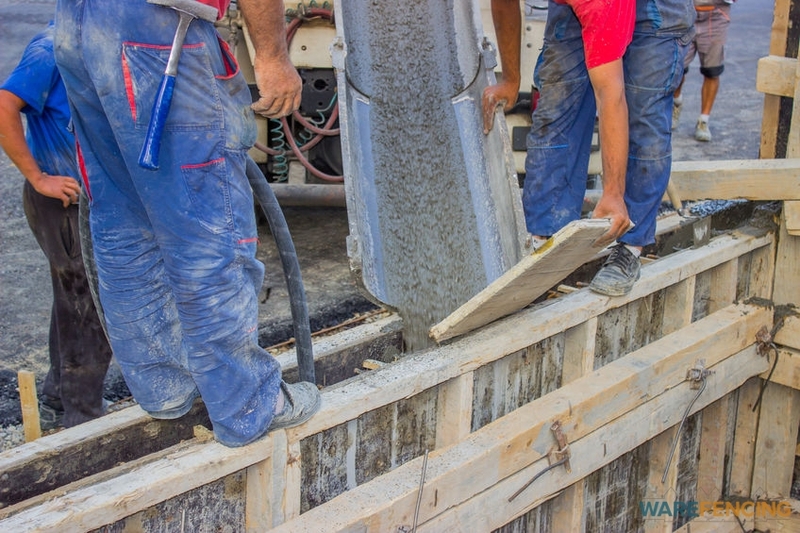 You want to make sure the people you hire to install your new retaining wall are experienced craftsmen who know how to pour concrete so it will last. Just like you’d only hire the best for your residential roofing in Cedar Park, TX, you should only hire the best for your new retaining wall. It doesn’t matter if you’re looking to create more flat land for your home, or a clear property boundary. When you’re looking for quality installation service of a concrete retaining wall in Crowley and Fort Worth, TX, contact the fence experts of Ware Fencing at 817-948-4503 for more information today! Posted in Uncategorized on April 8, 2019 at 1:12 pm by Ware Fencing. What is the Best Wood To Use for a Fence? Fences are a great addition to any home with the many styles and types of materials available that can aid in the longevity of your home’s outer protection! One can choose to opt for a classic wood fence, vinyl as a viable alternative or even a chain link fence for longer life. When considering what fence is better for you, think about what goals you want to achieve with the fence. Would you prefer low maintenance, low cost or is longer life span more of a goal? Each type of fencing material has advantages that can cater to certain categories of preferences while falling back on others. It’s important in your decision-making process to consider the pros and cons before ultimately making a commitment. In either case, you are sure to make an attractive addition to your home! What type of fence is best? Fences come in a variety of materials that range in use and protective features, here are the most popular types of fencing materials. For extra protection, you can eliminate space between wood panels! What type of fence lasts longest? Chain-link fences are considered to be the longest lasting type of fencing out there due to it’s non-rusting galvanized steel finish, because of this it also requires little to no maintenance. The drawback is that it won’t provide as much in protective qualities as may be desired. It’s important to note that there are certain types of wood fences, that can near the life span of a chain link fence. What is the least expensive fencing? Depending on the type of fencing you get in either category, chain link and wood fencing are the least expensive options for fencing. Chain link fencing can range anywhere from $5-$40 per foot while wood fencing can range $10-$20 per foot. What is the best wood for a fence? Consider different types of wooden fences for your home! 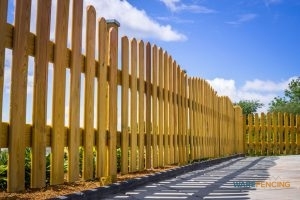 There are many types of wood fences out there yet here are a few of note. Cedarwood: (Master Halco) This is the most popular type of wood fence for residences. It has a light grain with few knots that are resistant to decay, doesn’t warp or shrink, repels water and insects. It is recommended to install concrete fence posts as certain types may not be impervious to soil in comparison to treated wood. It’s available in a variety of styles such as lattice-topped or Saddleback. It naturally weathers to silvery gray so for color and weathering protection an annual sealant application is recommended. Cypresswood: Cypresswood is rot resistant and contains a natural chemical deterrent to bugs called cypretine, which greatly increases the lifespan of the wood. Redwood: Redwood is an option that is used extensively although it’s cost is higher. It’s durable, resistant to insects and rot yet is recommended to use a stain to prevent it from turning gray with age. If moisture, dry conditions, freezing and thawing are prevalent in your area then this wood is not the best option as it will be prone to damages. What are the parts of a wooden fence called? You local fencing company is ready to assist you with your fencing needs! Is a wood fence better than vinyl? Vinyl is a great alternative to a wood fence if you’re willing and able to spend more! It won’t be susceptible to the damages wood is known for such as dry rot, fire, fungus or termites and it’s even able to imitate the look of it if preferred! It has a longer life span and is able to stand against the elements of weather rather well. It is virtually free of maintenance and only requires to occasionally be hosed down of dirt or washed off with mild detergent. Be sure to know that early vinyl fencing products had the tendency to sag, turn brittle after a few years and turn yellow, however, today’s fencing manufacturers solved this problem by offering more durable options. It’s recommended to select a “virgin” thicker gauge for the best longevity. 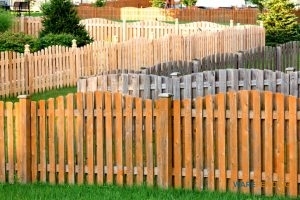 For wood fence contractors in Crowley and Fort Worth, TX call 817-948-4503 with Ware Fencing! Posted in Uncategorized on February 4, 2019 at 1:39 pm by Ware Fencing. Who’s Responsible for Fence Maintenance? Fence Care May Be Demanding for Natural Wood, But It’s Worth the Effort. Follow These Simple Steps! There are so many kinds of quality fencing available for your home, but few provide a rustic, homey appearance like natural wood. With the proper fence care, your spruce, pine or cedar wood can last for many years. As a dedicated homeowner, you will need to provide consistent maintenance for your wood system, typically every 2-4 years depending on the coating that you choose. Today, we’ll walk through the various maintenance tasks required to preserve wood fencing. We’ll also compare the benefits of paint vs staining, plus how you can protect your fence from common threats. With this information, you should be able to avoid the common pitfalls that other homeowners often suffer from. Then there are hazards that can damage the entire fence structure, such as severe winds, excessive weight and tree roots. As you examine the steps necessary for your fences care, these are the challenges to be overcome. It’s sometimes daunting work, but there’s a right way to go about it. How Do You Maintain a Fence? Fence Care Needs to Address Both Wood Health and Overall Fence Integrity to Be Effective. First of all, it’s worth noting that some materials are much more resilient against wood rot and insect damage. Pressure treated wood is one such material. It’s considerably easier to maintain than untreated materials, and it lasts up to 40 years (depending on your choose of wood)! Some natural wood materials, such as cedar, are also remarkably stronger against these hazards. Assuming your wood has already been chosen, the next step in fence care is cleaning. When cleaning dirtied wooden fencing, most homeowners prefer power washers for their quick and potent results. If you choose to use a power washer, set psi level to 1500 to 2000 and use a 25 degree spray tip. You should be able to clean both sides of the fence with relative ease, but make sure to hold the spray nozzle at least 18in away from the wood to avoid damaging it. After the fence has been cleaned and allowed to dry, the next step is to apply your sealant, paint or stain, which we’ll talk about in a bit. How Do I Protect My Wooden Fence? One of the most aggravating challenges to deal with is an invasive tree. Not only do their branches place a heavier weight on the top of your fence line, a tree’s roots can also push against supporting posts and cause an unsightly fence lean. If you’re worried about a nearby tree damaging your beautiful fencing, consider getting a professional tree assessment. There’s also the matter of extreme wind to contend with. The best way to protect your fence against this threat to ensure your fence line has sufficient supports. That includes the cement blocks you have surrounding the posts, and the any secondary reinforcing beams. The blocks effectively anchor your entire fence, while the beams provide additional sectional stability. Another great way to support your fence is to install bracers beneath the cross rails. How Many Years Does a Wood Fence Last? That depends on the material used for the fence and maintenance routine. As we mentioned earlier, pressure treated wood lasts considerably longer than natural alternatives. It’s more expensive obviously, but pressure treated cedar can last as long as 40 years. On the other hand, pine and spruce wood have far shorter life cycle. Even with proper fence care, untreated spruce’s lifespan could be as short as 6 years. Both Paint and Staining Provide Protection Against Rot, Insects, and Ultraviolet Light from the Sun. Untreated wood is vulnerable to insect damage and natural wood rot. Ultraviolet light from the sun is just as harsh on the wood. The most common solution is to either paint or stain the wood. Both options provide a measure of protection for your wooden fence. Paint allows you to add vibrant colors to your fencing, but it also tends to show it’s wear faster. On the other hand, stains (especially clear and semitransparent products) utilize woods natural texture to create a more rustic appearance. Paint products tend to be less expensive for fencing, but they also require more work to apply. Cracking and color fading are common issues to contend with. 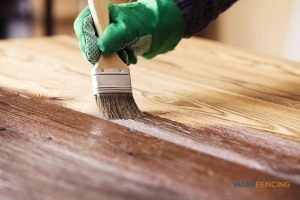 As for stains, they sink deeper into the wood, instead of sitting on the surface. Very little preparation is needed before staining. Which types of staining last the longest? How much stain do I need for my fence? How long should a fence dry before staining? Solid color stains are the longest lasting, enduring for around 3 years on average. Each can of staining typically lists the coverage area in square feet, which you’ll need to compare against the total area of fencing to be treated. After power washing the fence, let it dry for 24 hours before applying your stain. If the weather makes things to humid to start, let the fence dry another day. Schedule Your Residential Fence Care! 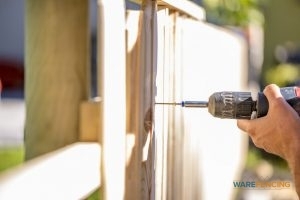 For additional fence maintenance tips, talk with our professionals at Ware Fencing! If you’d like professional help installing or repairing a residential fence in Crowley and Fort Worth, TX, give our team a call at 817-948-4503. We’d be happy to answer any questions you may have. Posted in Uncategorized on December 4, 2018 at 4:56 pm by Ware Fencing. Flagstone Offers a Beautiful, Natural Aesthetic for Your Garden Pathway. When it comes to putting the finishing touches on your landscaping, nothing brings all of your hard gardening work together like a beautiful garden pathway! A pathway not only offers a lovely walkway around the yard, but it also protects your feet and shoes from mud. With so many gorgeous materials to choose from, how can you know which will work best for your landscaping design? What are the Best Pathway Materials? Gravel offers a fast, easy solution for homeowners. All you need is a underlying fabric and sturdy edging to hedge your path. Concrete and clay pavers are two more simple materials to work with. Installing pavers is simple enough for most DIY’ers; you simply need to find a pattern that gets you excited! Natural stone offers a very clean and rustic look for your pathway. Flagstone is one of the more common choices for homeowners these days. 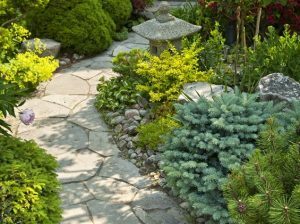 What is a Flagstone Walkway? Flagstone is a layered sedimentary sandstone that offers a luxurious aesthetic and simple function. Typically installed over a sturdy concrete base, flagstone looks fantastic with a wooden or tile roof installation. While you may have only seen this stone work in high-end housing systems, it’s surprisingly affordable. Get an Estimate for Your Garden Pathway! If you are planning your own beautiful garden pathway in Crowley and Fort Worth, TX or a nearby city, we’d love to help you! Talk with one of our landscaping experts at 817-948-4503! Posted in Uncategorized on October 10, 2018 at 1:40 pm by Ware Fencing. An Iron Fence May Suit Your Security and Landscaping Needs. As a homeowner, you are always looking for ways to improve the look and the security of your home. When looking for ways to improve the exterior look of your home, you may consider Texas landscaping services among other possibilities. However, have you considered choosing a new fence? A fence handles both appearance as well as security concerns, giving you the best of both worlds. How can you choose from the many available options? Consider what you want from your fence as well as the environment you live in. Most homeowners want a durable fence that looks great and can withstand most weather. If you are one of these homeowners, we highly recommend an iron fence. 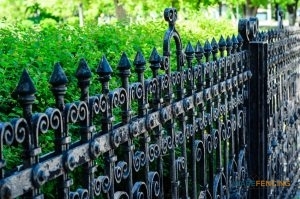 What is a Wrought Iron Fence? This system is strong and resists rusting, which means it won’t wear or warp quickly from rain. If any rust does occur, it is a simple fix and can be repainted when you want to freshen its look. Because of its durable nature, it adds to the protection of those within your property and your pets while also becoming a part of your garden design as well without wearing. Finally, this material can be designed to however you want, allowing your iron fence to match your style while defending your property. Ware Fencing is your source for fence installation and design in Crowley and Fort Worth, TX. Let’s get started today. Dial 817-948-4503 for your iron fence installation! Posted in Uncategorized on September 7, 2018 at 10:29 am by Ware Fencing. 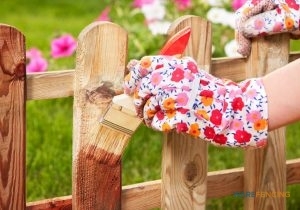 Check Out Some Ideas To Spice Up Your Fence. Your fence usually surrounds the whole back and sides of your home. On occasion, your fencing will line a sidewalk or back of a street so that everyone can see it. When this happens, it is important to keep your roof in the best shape possible, especially if you live in an area with an HOA. If you are tired of the old drab wood with nothing on it, there are things you can do to spice it up if you really want to. Things like adding plants to your fencing line that will grow up the front of the wood or around metal is a beautiful way to bring nature into your yard. This will also give a pop of color and elegant feel to your yard. There are a variety of plants out there to choose from; some that will grow flowers and some that will grow up and stay very green. Adding your own personal touch to your fence will make your neighborhood more attractive and also create a feeling of home. One fun way to bring your fence alive is to decorate for the holidays. You can get very crafty if you think hard enough or check out ideas on the web. With holidays happening all times of the year, you will never be at a shortage of ideas. You can wrap lights around your metal rods or hang Santa posters from your wooden fence if you are feeling in the Christmas spirit. We have seen a variety of creative decorations over the years, the best ones are always around Halloween. Whether you are painting your fence a solid color or you are creating a beautiful mural, you will need to pay attention to the kind of paint you choose. When you put paint on wood you will need to make sure that it is waterproof and good for not only the wood but being in outdoor conditions. There are also other companies out there that you can hire to paint your fence for you so you can kick back and relax while someone else does the hard work (we recommend this option). If you need a new fence or want to add something to your current on, give Ware Fencing a call at 817-948-4503. We are here for all of your fencing needs and will be happy to answer any of your questions that you may have. Posted in Uncategorized on September 7, 2018 at 11:05 am by Ware Fencing. When people hear the word retaining wall they constantly think about a wall to keep something out. If you look at retaining walls that can be built, you will realize that that is not the case in every situation. Residential and commercial residential rock retaining walls, can add beauty, security, and individuality to a yard or area. Backyards – If you have a large backyard that has slopes or even if you want to add some separation or depth, this is a great way to start. 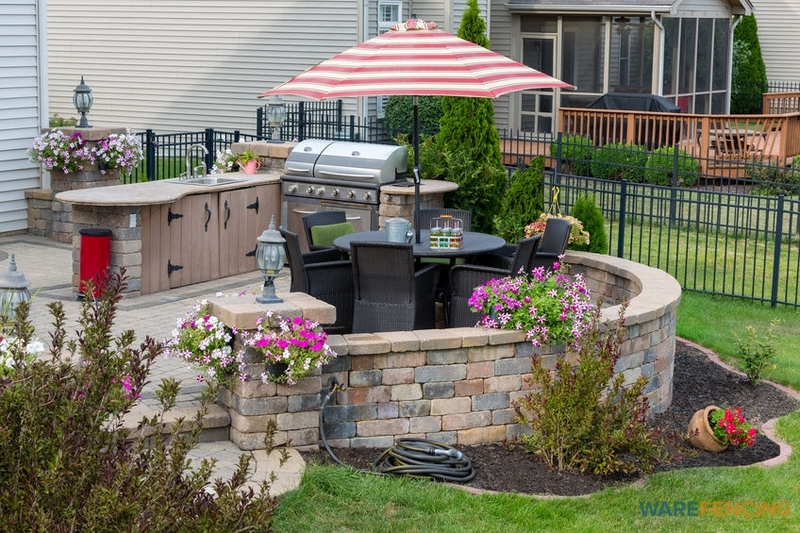 You can create a patio that has a rock retaining wall below it to lift yourself up above the backyard and then have the yard be below it. In Front Of Buildings – To give your building something extra, consider putting a retaining wall that you can line with flowers or even steps for seating. The options are endless. Front Yards – Don’t think that you cannot add these walls to your front yard. Creating an area that is built up that you can plant flowers in is a great choice that you can make. This will give your house the illusion of being bigger as well which is always a plus. 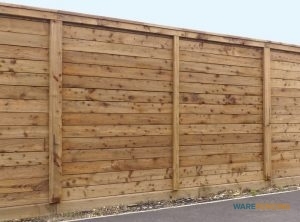 Call Ware Fencing today for us to come out and see what we can do. We are also always available with ideas or suggestions that will work best with you and your commercial or residential home. Call us at 817-948-4503 and let us get to work. Posted in Uncategorized on June 28, 2018 at 2:30 pm by Ware Fencing. Do you have livestock that you are wanting to keep fenced in on your property? Livestock is quite an investment and it’s important that your investment is protected and safe. one of the best ways to keep your livestock from staying on your property is with an electric fence. 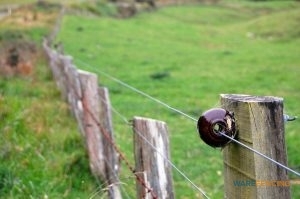 Don’t know much about electrical fencing? Below are the benefits of an electric fence for your livestock. Find Out About the Benefits of an Electric Fence. One of the best benefits of an electric fence is that it is really durable. It’s important that you have a sturdy fence in order to keep your livestock in and electric fencing really fits the bill. It might seem like installing an electric fence would be hard, but the only thing that is required is having a professional install it for you. The electric fence can be installed on top of or beside your existing fence. Because this type of fence can be installed anywhere or by your current fencing, it is one of the most versatile fence options on the market. Electic fencing, while it might not seem like it, is a really safe fencing solution. Barbed wire fences which are very popular for livestock, can severely injure your livestock as the barbed wire can cut them. You can adjust the voltage of your electric fence and the shock it produces isn’t strong enough to hurt livestock. To find out about more benefits of an electric fence in Crowley and Fort Worth, TX, call 817-948-4503 to talk with the professionals at Ware Fencing. Posted in Uncategorized on May 25, 2018 at 11:29 am by Ware Fencing. Versatile: Seen on both residential and commercial properties to prevent robbers. Durable: Helps maintain livestock as even the angriest longhorn can’t lift the posts from the ground. Cheap: Because it is made of wire, it is way more cost-effective than fencing your entire multiple acres of land with wood planks which are much more costly and age quicker. Customizable: Can choose the length of the barbs and how far they are placed on the wire from post to post. Easy Maintenance: Once the posts are in the ground, if wires ever break, they are easily replaced since they are simply stretched over the posts. Safety: While it may sound more dangerous, the electric shocks are not electric-chair worthy. Shocks from an electric fence feel like those from a dog shock-collar- a quick zap to let you know you did something wrong, like trying to enter or leave through the fence. Animals don’t scrape themselves as much from electric fences like they do from barbed wire and humans have less injuries installing or repairing them. Easy to install: There are no posts to dig into the ground like with barbed wire. Movable: Since it sits atop the ground, you can adjust the fence to give your livestock more room to graze. Cheap: Electric fences are also cheaper than wood planks, but are even cheaper than barbed wire when comparing panel by panel. 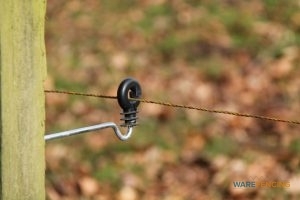 An electric fence will cost about half of what the barbed wire will cost. Lifespan: Electric fencing lasts 25-40 years compared to only 12 years of barbed wire fences. That is why they are more expensive upfront but save way more money over time instead of having to keep repairing or replacing fencing. If you are interested in getting barbed wire or electric fencing in Crowley and Fort Worth, TX, contact Ware Fencing at 817-948-4503 today. Posted in Uncategorized on April 23, 2018 at 1:18 pm by Ware Fencing. The Size or Complexity of Your Fence Can Depend on the Nature of Your Business. If you own a business, you probably care a great deal about security. This can apply not just to concerns about theft, but also safety issues. The installation of a security fence can present a boon to your business. Aside from leaving your property protected against threats, you can also help ensure the safety of your employees and customers. 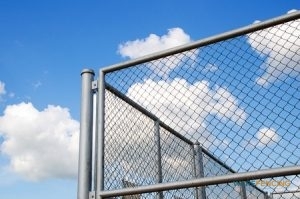 If you remain uncertain whether a security fence is right for your business, consider the following advantages. Oftentimes, the mere presence of a fence can deter would-be threats from a business. If you have your fence constructed in the right way, it can also frustrate the efforts of those committed to infiltrating your company. If you have valuable equipment or products, you should stay concerned about theft. For all those hours in which you must leave your business unattended, a fence can supply a secure first layer of defense. 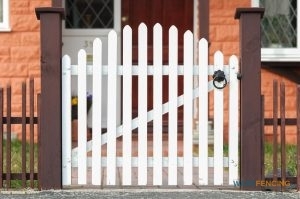 A lack of fencing can appear like a welcome mat to certain solicitors. So long as your property allows for walk-up access, you can count on a regular stream of salesmen and other undesired solicitors. A security fence not only prevents these people from wandering around your property, but provides to limit their intrusion to established points of access. This relates to the point above. A comprehensive security fence not only defends your business’s perimeter, but can also establish secure access points. If you want access to your business limited to employees or clients, a secure fence is an indispensable investment. To learn more about a security fence in Crowley and Fort Worth, TX, call Ware Fencing today at 817-948-4503. We are your local authority for all fencing needs. Posted in Uncategorized on March 20, 2018 at 11:19 am by Ware Fencing.